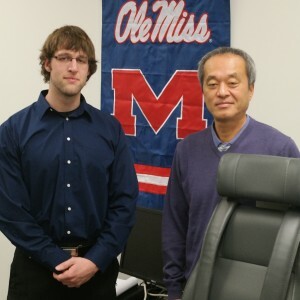 In a research laboratory in the Department of Health, Exercise Science and Recreation Management on the University of Mississippi’s main campus, there is technology such as an isokinetic dynamometer and B-mode ultrasound sonography. These devices can test muscle strength at different angles and speeds, as well as quantify muscle and fat mass. Dr. Jeremy Loenneke, assistant professor of exercise science, and Dr. Takashi Abe, visiting professor of exercise science, regularly use the technology to collect data during exercise. Since 2010, the two professors have published approximately 60 peer-reviewed scientific papers together on a variety of topics. Their research is largely based on exercise in combination with blood flow restriction and age-related loss of muscle mass.